Life Before the Dinosaurs: Haplophrentis. Haplophrentis was an abundant hyolithid with a conical shell with a flat bottom. Haplophrentis was 2 mm to 3 cm long. Many specimens of Haplophrentis have been found inside specimens of Ottoia, so they must have been really slow and easy to catch. Haplophrentis had two "helens," named after Walcott's daughter Helen, which were spines which may have been used as oars to help Haplophrentis push itself across the bottom of the ocean. The helens probably could have stabilized it, because the weight of its heavy shell would make Haplophrentis tip over and be easier to eat. Haplophrentis was found by Walcott in the Burgess Shale. Haplophrentis was probably either a mollusk or a relative of the mollusks. It had an operculum, which was a "lid" to shut Haplophrentis into its shell and conceal it. Even though Haplophrentis was so easy to catch, monster predators like Anomalocaris and Amplectobelua probably didn't bother to eat it, because it was too small. There are two species of Haplophrentis, Haplophrentis carinatus and Haplophrentis reesei. 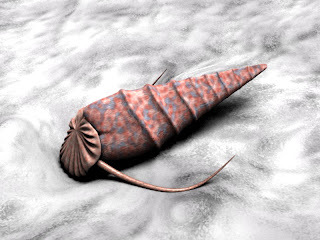 Haplophrentis reesei was found in Utah and Haplophrentis carinatus was found in the Burgess Shale. Haplophrentis was probably prey for animals such as trilobites and priapulids. Haplophentis was a bottom feeder and ate edible particles out of the sediment.